Bluetooth is a proprietary open wireless technology standard for exchanging data over short distances (using short wavelength radio transmissions) from fixed and mobile devices, creating personal area networks (PANs) with high levels of security. Using our SDK with Bluetooth enables another possibility to reduce costs. 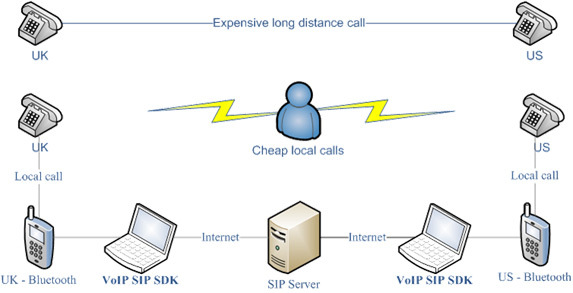 ABTO VoIP SIP SDK uses Bluetooth to convert telephone communication into internet sound and vice versa. This solution enables sufficient cost savings for execution of international calls.